On the road, it was a different story. They only got one away win all season, with seven ties. The results were poor, though the underlying numbers suggest they may have just been a bit unlucky. Their -14 GD on the road was 6th in the Western Conference, which was bad but not terrible. Even better, their road xGD was only -4.53, which was 4th. Head coach Wilmer Cabrera seemed content to play for the tie on the road, and it usually worked out for his side. It was the addition of streaky Honduran wingers Romell Quioto and Alberth Elis in 2017 revolutionized the Dynamo attack, as they combined for 17 goals and six assists in only 3094 minutes. DP Erick Torres led the team in xG with 13.3, though almost five of those were from PKs. Though he was somewhat maligned as not productive enough for a DP slot, Mauro Manotas was the team’s best striker last year, with 10.9 xG and 10 goals, coupled with five assists on 3.8 xA. One potential worry about Elis and Manotas was their lack of willingness to create for themselves. Among the 55 players with at least five expected goals in 2017, they finished bottom and third from bottom in unassisted shots. Some Everton fans once said "I get by with a little help from my friends," which Manotas (8.5% of shots unassisted) and Elis (4.2%) really took to heart. They relied heavily on the service of their teammates for their shots, which is certainly a partial product of how the team played, but is also abnormally low for players expected to carry much of the scoring load. The bulk of the midfield work fell to Alex, who had arguably his best season as a pro, notching two goals and 11 assists (seven primary). But 10 of those assists came before August, and by the end of the season he was playing more like the traditional holding midfielder he’d been for years, rather than the playmaker of early 2017. Initially happy just to make the playoffs, Houston got past an injury-ravaged Portland on the way to getting stomped by Seattle. 2017 for the Dynamo was like a satisfying sandwich; it was delicious, but there was no misconception it was ever going to be as good as a burrito. It was a solid season, Cabrera is an inventive and capable MLS coach (something they’d been missing before his arrival), and he’s assembled a solid core of players to build around. Last year was certainly something to build off. The biggest losses are Alex to a team in South Korea and Erick Torres to Pumas. On paper, losing your team’s leaders in both goals and assists could be disastrous, but there’s reason to think it won’t be in Houston. Manotas is still only 22, and seems ready to be the permanent starter. Torres never found his Chivas USA form for the Dynamo, and they've happily shed his costly contract. Ricardo Clark, who spent 11 years in Houston, is gone to Columbus. Veteran Vicente Sanchez retired, and… that’s about it. They weren't insignificant departures, but they weren't debilitating ones, either. They’ve brought in Chris Seitz to start the season in goal and added Arturo Alvarez and Darwin Ceren as a bit of depth pieces for the midfield. Youngster Alejandro Fuenmayor was signed from Carabobo FC in Venezuela to compete for the starting centerback role. With Torres gone, that leaves Elis and Tomas Martinez as the only Designated Players on the team, meaning they have room to add another to the roster. It doesn’t look like they’ll have any major additions before the season starts, but they’ll likely be in the market for a summer signing or two. Starting from the back, Tyler Deric seems like the starter once he’s back from suspension, although his role is unclear. Until then, it will be Seitz between the sticks. The indefatigable Demarcus Beasley will continue to own the left back spot, with George Malki, who missed 2017 with a torn ACL, the likely starter on the right until A.J. DeLaGarza heals from his own ACL tear. If Malki can’t lock it down then Adolfo Machado will slide over, though Machado’s preferred position is in the center. The constantly confounding Leonardo started most of last season as the centerback, but 21 year-old signing Fuenmayor appears to be challenging him for the spot. As centerback depth they have former A̶r̶s̶e̶n̶a̶l̶ Grasshoppers player Phillipe Senderos, and Dylan Remick will back up Beasley on the left. It’s a relatively shallow defense that should suffice. They won’t set the record for clean sheets, and they won’t be the worst in MLS, either. It’s an old defense – of the probable defensive rotation players, the average age is 29 – so hopefully Fuenmayor can solidify himself as the starter because Beasley (35), Machado (33), Senderos (33), and Leonardo (30) aren't getting any younger. That's clear because you can't age backwards unless you're Benjamin Button, and even he was a fictional character. Midfield is undoubtedly the strength of this team. Juan David Cabezas will hold down one of the defensive midfielder spots, probably next to MLS journeyman Eric Alexander, who seems to have found his home in Houston. Competing with Alexander is Darwin Ceren, who joins from San Jose. Tomas Martinez, who signed last summer as a Young DP from Sporting Braga in Portugal, will be the attacking part of the midfield pivot. He only played 547 minutes last season, but his two goals and 18 key passes in only five starts suggest he’s as good as they’d hoped. Andrew Wenger will try to bring offense off the bench. Arturo Alvarez will be a midfield change of pace off the bench, similar to the role Vicente Sanchez played as a super-sub last year. Also contributing will be veteran Oscar Boniek Garcia, who finished 4th on the team in assists last season, despite playing the fewest minutes of his MLS career. Homegrown Memo Rodriguez will hope to find time in the Open Cup. It’s clear that Cabera has confidence in his attacking line because the team doesn’t have anyone to back them up. And that’s not just sarcasm – Manotas, Quioto, and Elis are the only three forwards listed on the official roster. Dynamo fans let out a quiet collective sigh of relief when Honduras was denied a World Cup bid by losing to Australia, meaning Quioto and Elis won’t need to miss time to visit Russia. And for good reason. 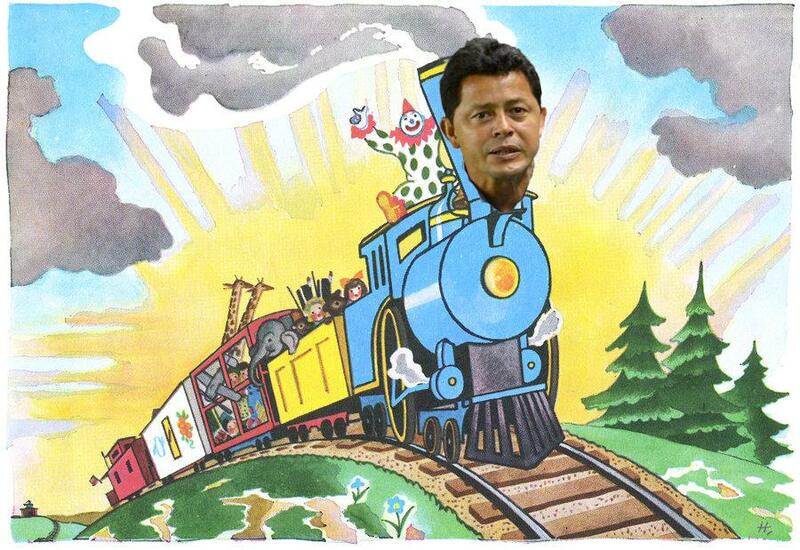 Those three will line up across the top of Cabrera’s 4-3-3, and they’re the lifeblood of the team. Of the returning players from 2017, they accounted for 44% of the assists and 72.2% of the goals. Wenger will likely be the forward replacement from the bench, but his attacking contribution will be a significant drop off. 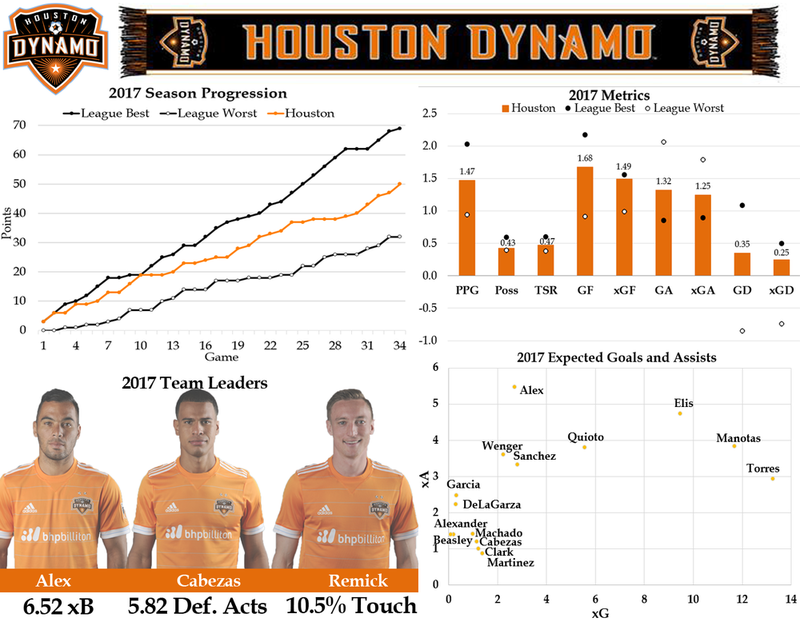 The Dynamo attack is a potent one, and if their forward trio can pick up where it left off last season then there’s no reason to be worried. But if one of them gets injured, it has the real possibility of sinking the entire season. If the team makes any signings in the next few weeks, the attack is almost certainly where they’ll come. If everything goes right; specifically, Martinez proves his worth, the Dynamo’s forward trio can stay healthy, and they sign some attackers before the fall, Houston is fully capable of making another run to the Western Conference Finals. Still, it’s mostly the same team it was in 2017, with less depth. Given that all the teams around them have improved in the offseason, it will be difficult for this squad to even hold serve. If they’re forced again to rely on Leonardo as a regular starter, Beasley finally shows his age, or Manotas can’t handle the load as the full-time starter, it’s not hard to see this team end the season near the bottom of the West.